Newark and Sherwood District Council’s housing stock is managed by Newark and Sherwood Homes. Set up in 2004 as an Arms length Management Organisation (ALMO) to manage, maintain and improve the Councils stock of 5500 properties. Eastfield Close in Clipstone, is a complex of 40 bungalows built in the mid eighties. All the timber fencing and gates on the front elevations required renewing. 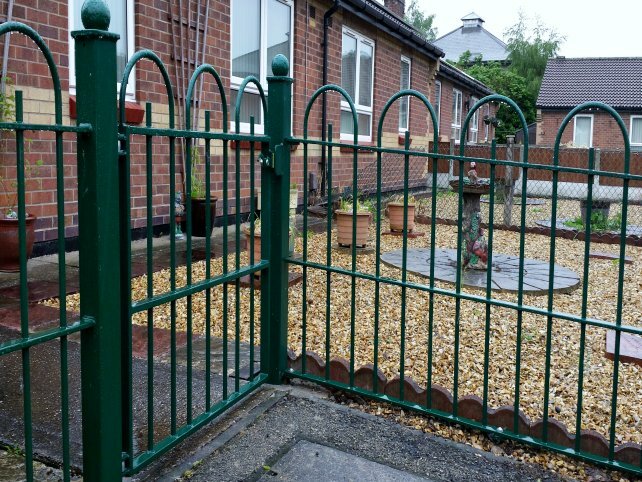 Alpha Rail was appointed to manufacture and supply 250m of 1m high decorative bow top railings and entrance gates to each property. The installation also included a number of raked panels in order to ensure differences in pavement gradients delivered an even level finish. 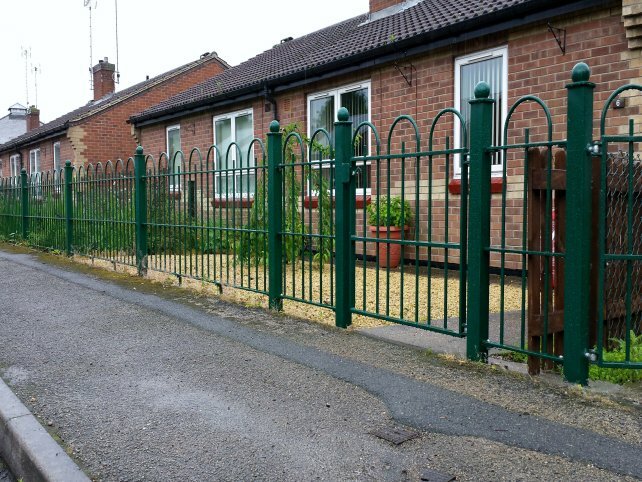 Having removed the old wooden fencing, it was replaced with metal bow top railings which were galvanized and powder coated in RAL 6005 Moss Green paint to provide long term protection against the elements. 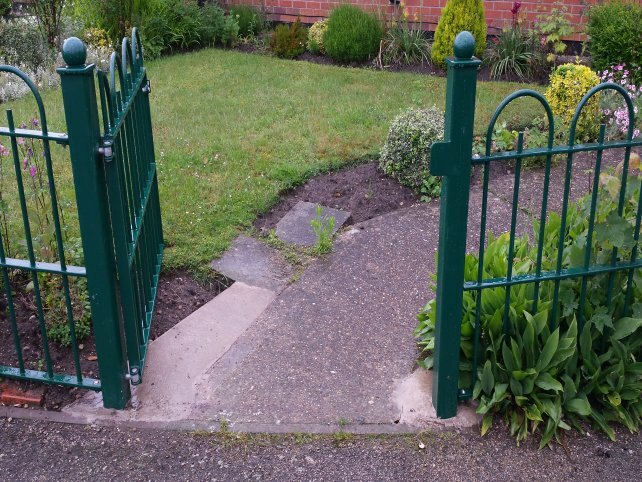 Installing metal railings has also helped reduce maintenance costs as the need to repaint the wooden fence panels is no longer required. The metal railings have also enhanced the overall appearance of the area and will retain their newly painted look for many years to come. "“Newark & Sherwood Homes has built a reputation for ensuring its properties are well maintained and pride ourselves on delivering excellent housing services with a ‘customer first’ ethos. 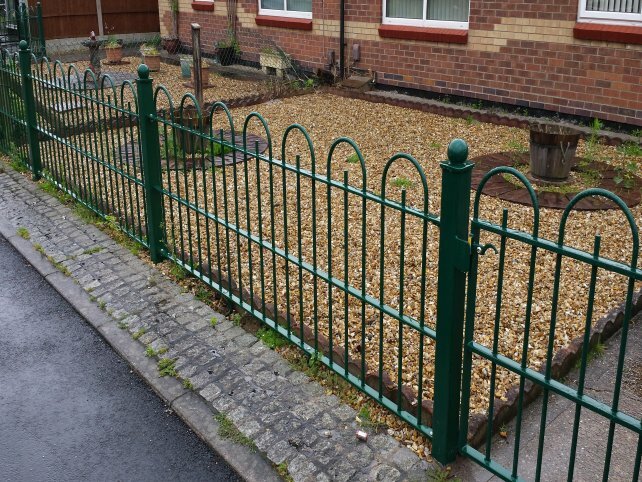 Alpha Rail offered a very cost effective and efficient service and both ourselves and the residents of Eastfield Close are very pleased with the finished result. The project was delivered on time, and on budget without any problems despite some severe Winter weather”.